If you are looking to further your horizons in the world of dance or just want to enhance your media skills then we have a workshop for you. We have teamed up with the members of Apple to have exclusive access to their store in Watford. 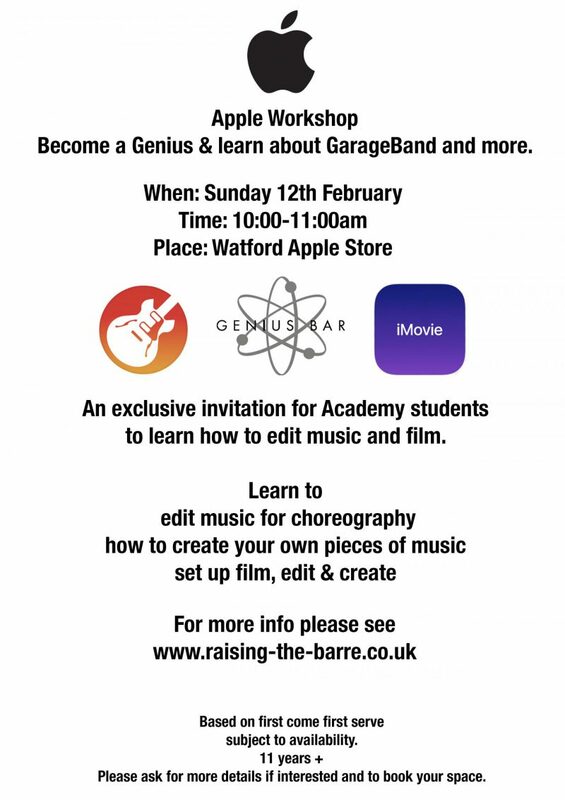 Academy members can learn about iMovie and GarageBand used on Macbook, iPad and iPhone. GarageBand is a whole music creation studio inside of your devices. Complete with a sound library full of instruments you can learn, play, record and create. Learn how to cut and fade music for choreography or enhance your music to get the maximum impact. It’s a great skill perfect for dancers looking to take their career further afield for choreography and auditions. Link together clips of choreography to create Hollywood-style films that anyone would be proud of. Create studio-quality titles, delve into extra-special effects and choose from a selection of soundtracks. A great opportunity to learn how to enhance audition tapes that will make you look above the rest. This is an ideal oppurtunity for those looking to study dance as well as creating and editing music and film for auditions and exams. We will be meeting outside Apple’s Watford store in the Intu Shopping Centre. The lesson will run from 10:00am till 11:00am on Sunday 12th February. If you have a MacBook great! Bring it along with you. If not you can still participate! Bring along any iPads and iPhones as you will be able to use these as well. Parents are erged to go off and shop and enjoy a coffee within the hour! Simply deliver your child outside the store to us and pick up later. Easy! This workshop is aimed for people 11 years and older. To book your space please let us know ASAP as their is limited spaces and is subject to availablity. We hope to see you there and can’t wait to be able to edit and create just in time for the upcoming Gala Show!